FMC adapted a ‘good neighbor’ policy when it installed a specialized, countercurrent packed tower scrubber into its seaweed extraction process system. The tower recovers isopropyl alcohol from the company’s process, thereby reducing pollutant emissions at the Rockland, Maine facility. The unit rids of the need for additional pollution control instrumentation and eliminates the risk of an alcohol-induced fire, too. And that makes for better business, says Bill Gilbert of the Clean Air Group, LLC manufacturers of the tower scrubber. In most applications, such as soybean oil processing using the solvent hexanerecovered solvents are re-used, tacking on significant cost savings. 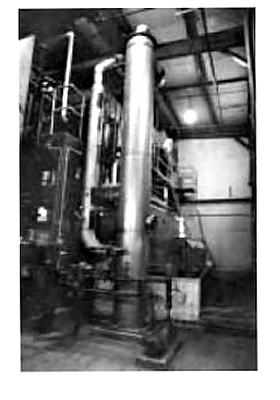 FMC does not reuse the isopropyl alcohol, though the packed tower column has an efficiency of 95 percent handling 600 pounds of isopropyl alcohol (IPA)/hour. The Unit Itself: The specialized unit handles variable gas flow at a rate of 1400 CFM, where alcohol process vapors are collected from the air stream. Solvent vapors are concentrated to such a level that they can be readily absorbed and recovered. Gas flow is channeled upwards through a packed bed while the scrubbing liquid flows downward by gravity over the packing for high efficiency gas absorption. The packed bed consists of a special small diameter Spiral-Pac of l-inch dimaeter. This provides an extremely high surface area for maximum gas absorption while maintaining the unit’s ability to minimize water. The high vapor pressure of IPA requires that the water be used on a once-through basis. A packing which can minimize the amount of water required to thoroughly wet all surfaces is surely a valuable design tool. In this case, the packing can work with rates as low as 2 gpm per square foot. The spiral packing allows the tower to handle a wide range of gas flows from 300 to 1400 CFM. 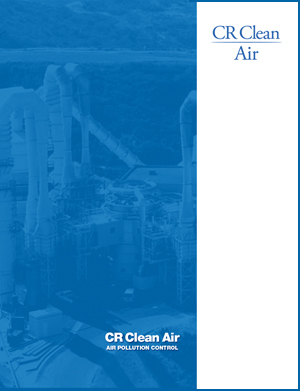 Pollution Control Advantages: FMC Process Engineer Paul Geisler reports that the advantages of this system make it desirable for many types of air pollution control applications. These include minimum maintenance requirements, low pressure drop and ease of installation. In addition, this type of packed tower scrubber can be designed for any particular efficiency desired. Based upon actual test data and results from the installation, the manufacturer can select the type of packing, scrubbing liquid, and tower size best suited to an application. Since these units are custom designed for each application, any desired efficiency can be obtained at the lowest initial cost. The packed towers are available in many construction materials. This particular unit is fabricated from type “304” stainless steel to prevent corrosion and avoid any potential fire hazard present with fiberglass. The internal packing and supports are of polypropylene construction for good corrosion resistance and minimum maintenance.